Berlin (dpa) — The chances for a conclusion to negotiations on the Transatlantic Trade and Investment Partnership (TTIP) this year are poor, Luxembourg‘s foreign minister said in an interview with a German newspaper published Monday. "I see neither in the substance nor in the process a chance that under the Luxembourg presidency the TTIP negotiations will be concluded," Jean Asselborn told the Sueddeutsche Zeitung. Luxembourg takes over the rotating presidency of the European Union on July 1 for a six-month term. Not a single important point has been resolved in the negotiations thus far, the Social Democrat said. One crucial point is that the US and the governments of all 50 states open tender processes to EU companies, he said. On the issue of the investor-state dispute settlement clause, which spells out how to handle disputes between companies and member states, proposed arbitration panels would only be considered if they meet openly, if an appeal is possible and if judges instead of lawyers comprise them, according to Asselborn. In general, he said, EU standards for consumer protection and public service must be maintained, adding "I am not prepared to die for TTIP." 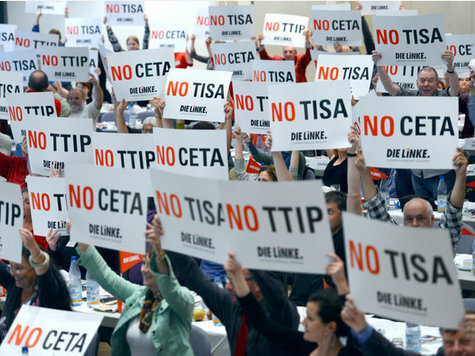 The EU and the United States have been negotiating TTIP for nearly two years. The aim is to dismantle regulatory barriers, establish common standards covering food, product safety and data protection and break down other non-tariff barriers. If successful, it would create the world‘s largest free-trade zone with about 800 million consumers. The estimated value of goods and services traded daily between Europe and the US is 2 billion euros (2.27 million dollars). Environmental and consumer protection advocates as well as unions fear standards will be aligned at the lowest level and criticize the secrecy of the negotiations. The next round of talks - the 10th - are scheduled to be held in July.